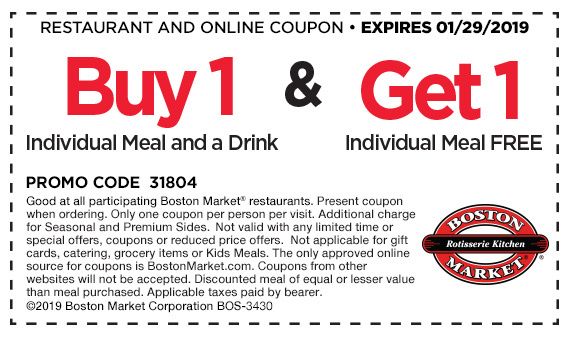 Savvy Spending: Boston Market: Buy one meal and a drink, get one meal free! Boston Market: Buy one meal and a drink, get one meal free! Boston Market is offering a FREE individual meal when you buy an individual meal and a drink. Just print this coupon or order online with code 31804. One per person; not valid with other offers or kids meals. Valid through 1/29 only!